Our Lady of La Leche movement PH shared on their official facebook page photos of the send off Dantes Family prepared for Nuestra Senora de La Leche yesterday. “After 9 days of daily novena prayers to Nuestra Senora de La Leche. 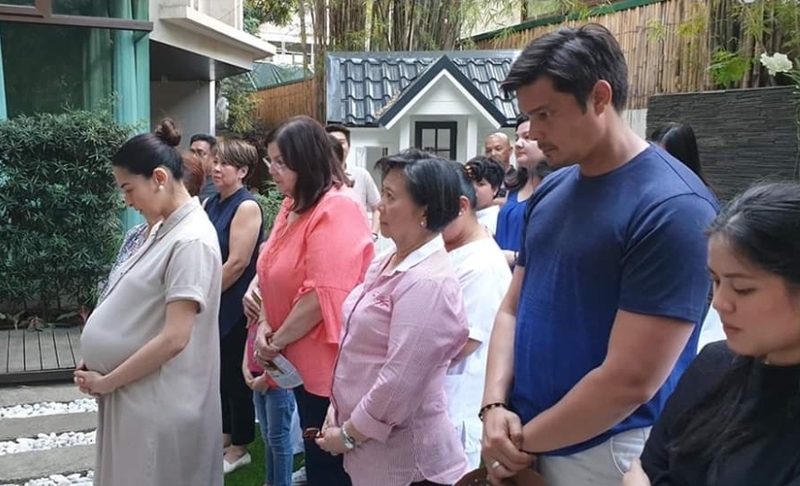 The pilgrim image of Mama Mary is given a beautiful send off by the Dantes family. It was a wonderful visit indeed. It is so encouraging that a family as busy as theirs will still take time to pray together. And teach their little one the rosary. Thank you for this opportunity to share the love of Mama Mary and tell more people about the breastfeeding mother. For those wishing for a visit, please send us a private message at Facebook.com/lalecheph. It was attended by Dingdong and Marian’s both side of the family. Meanwhile, Dingdong Dantes and Marian Rivera should be proud of their daughter Zia Dantes. At a very young age, people see a place for her in showbizness because of her jolly and kind act towards other people. She is easy to give instructions to so her co-workders or people shes been with are very glad about it. The great thing about Zia is , she is not aware that shes ‘working’, especially in the tvc she made she where thers with a dog , a ball and with her mother Marian. She is the youngest awardee for haviing an award of exceptional convesation and speaking skills. Its is only the beggining of her talent recognition.